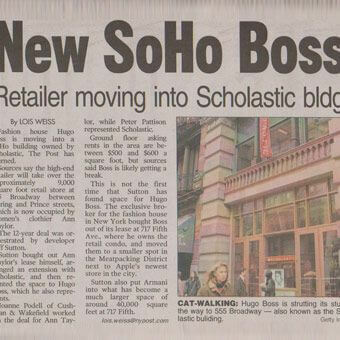 New Soho Boss Retailer Moving into Scholastic Building, by Lois Weiss. Fashion house Hugo Boss is moving into a SoHo building owned by Scholastic, The Post has learned. Sources say the high-end retailer will take over the approximately 9,000 square foot retail store at 555 Broadway between Spring and Prince streets, which is now occupied by women's clothier Ann Taylor. The 12-year deal was orchestrated by developer Jeff Sutton. Sutton bought out Ann Taylor's lease himself, arranged an extension with Scholastic, and then re-rented the space to Hugo Boss, which he also represents. Joanne Podell of Cushman & Wakefield worked on the deal for Ann Taylor, while Peter Pattison represented Scholastic. Ground floor asking rents in the area are between $500 and $600 a square foot, but sources said Boss is likely getting a break. This is not the first time that Sutton has found space for Hugo Boss. The exclusive broker for the fashion house in New York bought Boss out of its lease at 717 Fifth Ave., where he owns the retail condo, and moved them to a smaller spot in the Meatpacking District next to Apple's newest store in the city. Sutton also put Armani into what has become a much larger space of around 40,000 square feet at 717 Fifth.